On Friday, the Justice Department sent letters to nine jurisdictions requiring them to certify that they are in compliance with the federal law requiring certain forms of cooperation with federal authorities in enforcing immigration laws. But Seattle was not one of the recipients. 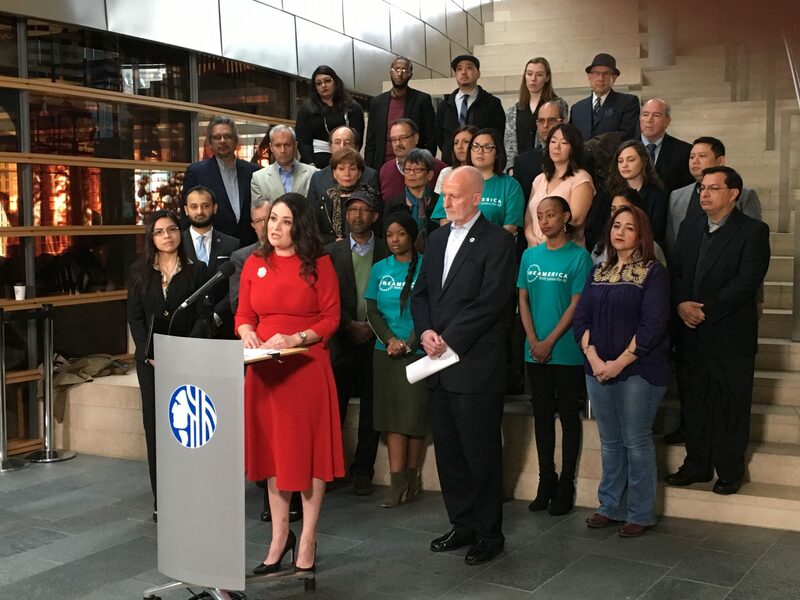 This morning, Council members Lorena Gonzalez and Tim Burgess announced that they will be submitting legislation to create a $1 million fund to provide legal support for immigrants and refugees in their civil immigration court proceedings. Last month the Secretary of Homeland Security issued two memos on immigration enforcement One of the memos directed Immigrations and Customs Enforcement to start issuing regular reports on state, county and local jurisdictions who refuse to give full support to ICE’s enforcement of immigration laws. The first report came out today. This morning US Magistrate Judge James Donohue held another hearing in the case of DACA recipient Daniel Ramirez, who has been detained by Immigration and Customs Enforcement for nearly a month. Yesterday the Seattle Police Department submitted a report to Council member Lorena Gonzalez on its mutual aid agreements with other police departments in Washington state, and on how those are impacted by the city’s refusal to enforce federal immigration laws. Today the legal team for Daniel Ramirez filed an emergency motion for his conditional release pending a final determination on his petition for habeas corpus. The day began and ended with activity related to President Trump’s executive order on immigration. One of the big stories this week — locally and nationally — has been the arrest and detention of Daniel Ramirez Medina, a 23-year-old resident of Washington State who was brought to the US illegally as a child and has been a beneficiary of the Obama Administration’s Deferred Access for Child Arrivals (DACA) program since 2014. Last Friday he was arrested and is still being detained by U.S. Immigration and Customs Enforcement (ICE). And at a time when immigrants — both legal and illegal — are living in fear of the Trump administration’s saber-rattling about immigration policy, this has become a key test for the fate of DACA under Trump. Tomorrow morning at 10am, there will be a hearing in his case before a U.S. district court magistrate judge. The government filed their brief this morning; Ramirez’s legal team filed their response tonight. And the stuff that’s in them is mind-blowing. What happens when a police force exhausts the resources it can deploy to handle a crisis situation such as a riot, a larger-than-expected mass action event, or a natural disaster? Most police departments use “mutual aid” agreements to call on neighboring police departments as needed to supplement their own resources. These agreements benefit small towns and large cities alike, not to mention special public-safety organizations such as the Port of Seattle Police. But they can also create issues when the two departments work under different policies. This has come up twice for the Seattle Police Department, and by extension the City Council, in the last three days.